Over the years there have been many studies of successful high achieving people, the objective being to find the secret and bottle it for commercial use. Contrary to what most people think it is not those who are most academically clever or those who work the hardest who always become successful in their chosen field. 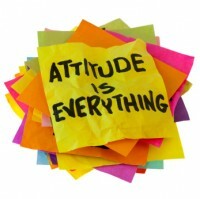 The only personality trait with a significant relationship to success is a positive attitude. Of course sports coaches have known this for years. Especially in team situations a coach will not tolerate an individual with a negative or disruptive attitude. Attitude is infectious, often a new member of a team with an exceptional positive attitude can lift the whole team very quickly. However the opposite is also true which is why coaches dump players with bad attitude as fast as they can. Many studies in the educational field have found that children taught by teachers with high expectations of their pupils will outperform those taught by teachers with lower expectations. Studies also reveal that the children with high achieving parents are also more likely to be high achievers because of the positive expectation (not pressure) they receive from their parents. The law of expectation works through the effect of consistent positive messages being sent to the unconscious mind. Expectation leads to confidence that leads to commitment, which leads to better performance. Having a good attitude doesn’t guarantee success, but it does guarantee a higher probability that an individual will perform at their peak, which can significantly increase their chances of success. Personal beliefs are highly influential in forming attitudes. A person’s beliefs are feelings of certainty about something which they never question and form the basis of how they live their lives. The strongest beliefs usually concern issues such as religion and other moral values such as law and order and family duties. Most people are held back in life by the limiting beliefs they have about themselves. A strong limiting belief stops people from attempting things they believe they cannot achieve. Of course some limiting beliefs will have greater credibility than others but many exist through unfounded prejudices which have been built up over years and have little if no real evidence to support them. An example is someone who has been told by their parents that they are no good and will never amount to anything. Many of us have suffered from such comments and while some people manage to ignore them, far more of us don’t, and live our lives far below our true potential. The most important thing to understand about beliefs is that they affect the way we behave regardless of whether they are true or false. As a result we frequently under perform for no valid reason, we just don’t believe we can do any better. We can, however, use this blind belief system to improve our performance. Many professional sportsmen and women have beliefs about their abilities that far exceed reality, they believe they can achieve the impossible like scoring every time they get the ball in football or holing every putt in golf. This is typical “good attitude” thinking. Of course they never achieve their unrealistic expectations, but they regularly perform at a higher level than they would have, had they held realistic beliefs about themselves. The first step in discarding limiting beliefs is to become aware of their existence. As they are largely unconscious this is often easier said than done. Everyone owes it to themselves to challenge their beliefs. Ask yourself if there is any real evidence to support the limiting beliefs you have, or have they been built on the careless remarks of significant people in our early lives such as parents, older siblings, teachers, coaches etc. Discover your limiting beliefs and discard them. Replace them with optimistic beliefs strategically designed to improve your performance. Alternatively, ensure your beliefs are based on hard evidence instead of false assumptions and prejudices.